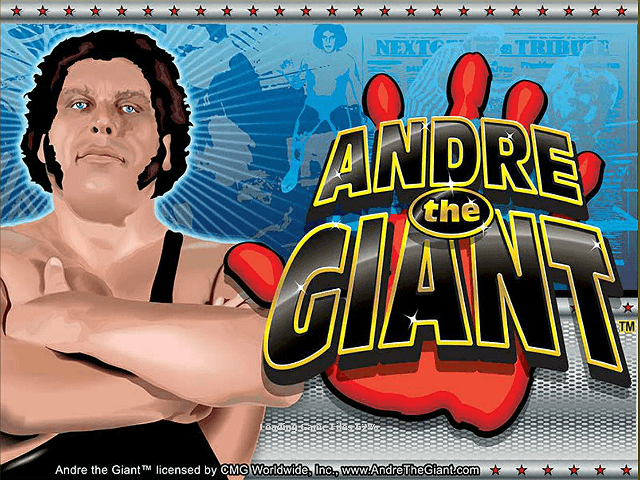 The André the Giant online slot is a five-reel, twenty-five payline game developed by NextGen Gaming, part of the NYX Gaming Group. 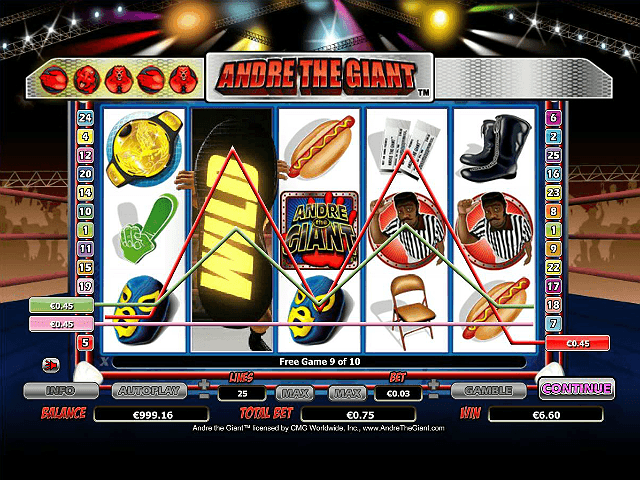 This exciting slot is based on the career of the larger-than-life professional wrestler who made a huge impact in the ring as well as on the big screen, the one and only André the Giant. From famously feuding with Hulk Hogan to his Hollywood cameos to his 14+ year undefeated streak in the ring, André the Giant's legacy is long and full of quality memories. Read this André the Giant slot review to see if the online slot bearing this legend's name is worthy of a shot at the Championship belt! It's a testament to André Roussimoff’s popularity that he's still well-known today, despite sadly passing away in 1993. 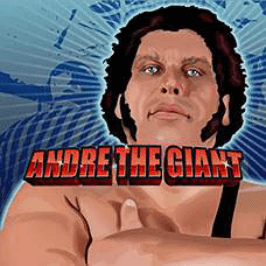 The André the Giant online slot game focuses on the French wrestler and actor’s time as a main character in the World Wrestling Federation, where he faced off against colourful characters like Hulk Hogan, Big John Studd, and Bret ‘The Hitman’ Hart. Every time you spin the reel, 80s rock music will kick in, as if you're running up the ropes of the ring, ready for a fight. Software provider NextGen Gaming has crafted a video slot that delivers a nostalgic feel, with cartoon icons of classic wrestling motifs like the ring, referee, tickets, large foam fingers, and the controversial steel chair. Unlike the men in Lycra, the classic slot doesn't feature a story, delivering a straight-up fun gambling experience. 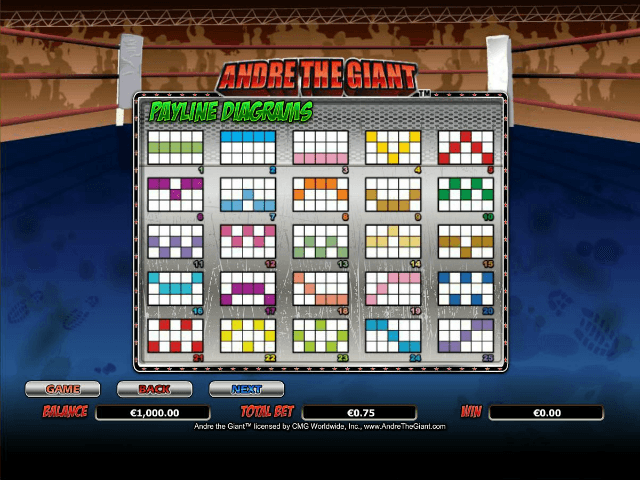 You don't have to be a fan of wrestling to enjoy the André the Giant slot, with a generous return-to-player of 95.65%. Although the real wrestling events make their money from tickets sold or hot dogs eaten, for players these slot game symbols offer small returns. Striking three of these will pay back five times the stake, while hitting a full five matching symbols will pay out 100x the initial wager. Wrestling memorabilia like André the Giant’s trademark black boots can net you 150x whatever you bet. André wore a blue mask when part of The Machines tag-team, and scoring five of these slot game symbols on a single payline will bag you 300x the bet. The same amount can be won by striking five steel chairs, which André used to pummel his opponents. The wrestling ring symbol and championship belt are worth 500x the bet if you score a full payline, but what you really want to aim for is the unlucky referee, who usually gets knocked out during the match. If you land five of the symbols, you could win 1,000x the bet. André's mysterious red-masked opponent is worth up to 5,000x the initial wager if he haunts all the slots on a payline. The André goes Wild feature casts the wrestler as the wild symbol, appearing on reels two and four. If he's there, André takes over all other icons on that reel, with the exception of the scatter symbol, which in this case is the game logo. Striking three or more of these will win you ten free games and start the Battle Bout bonus. The aim of the bonus round is to collect special-move symbols on reel five before the free games are over. Take your gathered special attacks into the ring, and if three or more of them manage to make contact, you need to decide which of André the Giant’s signature finishing moves you'll use to see off your opponent. Choose between the Sitdown Splash or the Double Underhook Suplex, with the right one winning another bonus of 20x the triggering bet. Compared to slots like this one found around all the best slot sites on the web, André the Giant online slot offers generous bonuses and useful multipliers! If you like Andre The Giant - You'll like these slots too!